At 385 feet per second top speed, this crossbow is on par with more expensive items on the market. Its noise and vibration reduction capabilities are superior. It is secured against dry fires and comes with finger safety reminders. Some people comment on the quiver and the scope being of inferior quality compared to the rest of the crossbow. If you have been searching for a crossbow that is both efficient and lightweight, you are looking at it. The Ghost deserves its name, as you will be able to sit at a comfortable distance from your prey, hiding in the brush and waiting for the right moment to shoot. Once you take your aim, you can be sure that your bolts, fired at 385 feet per second, will reach their target. 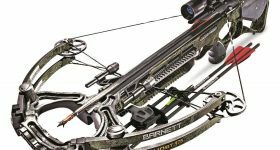 The outstanding precision and efficiency of this crossbow recommend it for those looking for power packed in a relatively lightweight package. Offering some extras that will make your life easier, the Barnett Ghost 375 is adaptable and provides easy handling for people who want to hone their hunting skills while taking advantage of a good quality weapon. The overall weight of this crossbow is only 7.1 pounds, which is a great starting point because many other similar models tend to be bulky and awkward to carry around. If you intend to travel light and move around without making noise, this model should be the one you should carry. Durability is essential for any hunting gear, and it is an excellent thing that this model uses high-quality materials in its construction. 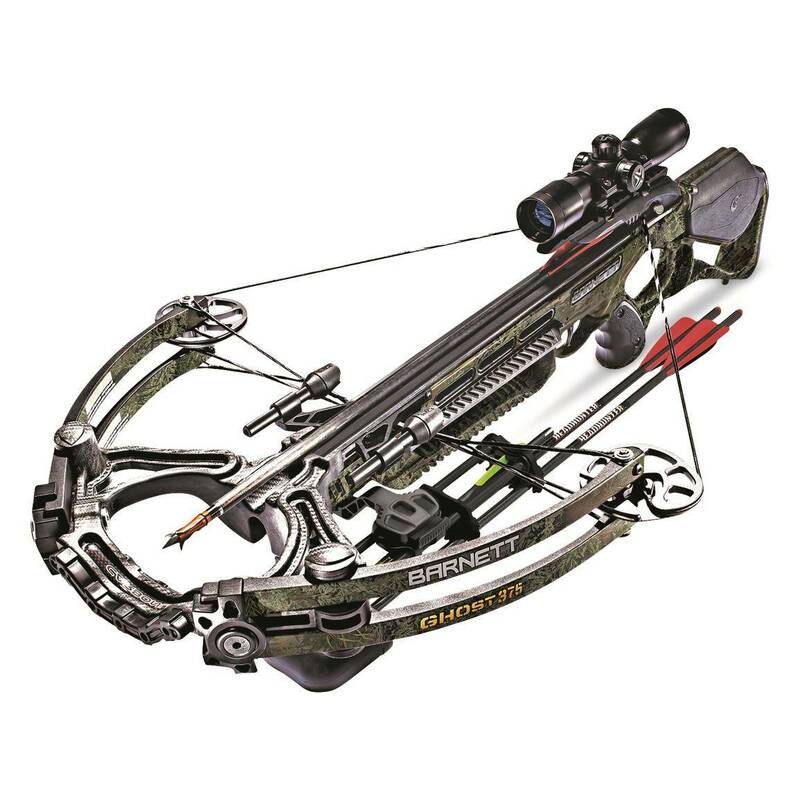 The components are made from stainless steel which, besides durability, grants the crossbow resistance to corrosion. You will surely appreciate the fact that the model is delivered assembled for the most part so that you don’t have to struggle with what goes where. Ready to shoot right out of the box, it is the type of weapon any beginner will appreciate. From axle to axle, this model measures 20.25”, so it may not be the most compact you can find. Due to the lightweight construction, the crossbow is easy to handle, and you will not have one thing to complain about when it comes to evaluating it against other crossbows. The kinetic energy released is 125 ft lbs for this model, and for its draw weight, which is 165 pounds, the speed of 385 feet per second is an outstanding feat. Available in Realtree camo pattern, it is an attractive crossbow, too. It will help you blend in with the environment so that the prey cannot even tell that you are there. In the Carbonlite series, it is the most lightweight, and, at the same time, its capabilities and easy handling are not sacrificed. Actually, all the elements of its construction contribute to cutting down bulk so that you can move through the woods or any other terrain without making unnecessary noise and without having to haul heavy equipment with you. There are many exciting features on this model that must be mentioned. The trigger technology used with a 3-pound zero-creep release is one of them. There is also a nock sensor that will eliminate the risk of dry fire, something to bear in mind in case you want a crossbow with some safety features installed. The CTR riser is ultra lightweight, and that contributes to the easy handling of this weapon. The Picatinny rail comes in handy and allows the installation of other attachments with ease. If you want to, you can use a crank cocking device with it, and the pass-through foregrip is another excellent example of the features this model comes along with. The finger safety reminders contribute to the overall security factor of this model, and beginners will find it easy to use. Let’s not forget that this model comes equipped with a few interesting extras. For instance, the 4x32mm scope helps with aiming at targets with maximum efficiency, while the rope cocking device will reduce the effort you’ll make to prepare the bow for the next shot. The two Headhunter arrows included come in handy, and so does the quiver that is included in your purchase. Another thing that must be said is that the manufacturer also supplies some lube wax for maintaining the strings. Anti-Vibration Technology is used for the limbs of this crossbow, which means that the construction of the weapon contributes to silent operation. Regardless of where you go hunting, be it open prairies, or thick woods, you will need to ensure that your prey cannot hear you. Using the scope and taking advantage of the high velocity of this crossbow, you will be able to remain invisible, and your crossbow will not make noise, either. The way the limbs are designed reduces vibrations, and you will be able to enjoy a silent and deadly weapon when you go hunting big game. Because it is lightweight, the crossbow is easy to carry around, and that can assure the success of your hunting trip. Designed to help hunters achieve maximum success, the Barnett Ghost 375 is an excellent example of value meeting good pricing. It comes almost assembled, so there is little you will have to do to make it ready to shoot. Some useful extras are provided, for maximum convenience. Its sleek appearance and the camo pattern make it an excellent choice for hunters who appreciate their ability to move around quickly.